Two Major League Baseball teams announced today that they have signed Japanese players. What’s interesting is that these two teams have never signed a Japanese player ever. In total there are 14 Japanese players in the MLB. The Boston Red Sox lead the MLB with 3 Japanese players, the Seattle Mariners have 2. The Baltimore Orioles signed right-hander pitcher Koji Uehara to a 2 year deal worth about $10 million dollars. Before coming to play for the Orioles, he spent the last 10 seasons with the JCL Yomiuri Giants. From stats alone, this seems to be a great pick. His career average is 8.00 strickouts per nine innings pitched. That technically would rank him as #7 among the best pitchers of in MLB. The Atlanta Braves also signed a right-handed pitcher. Kenshin Kawakami comes from the Chunichi Dragons of Japan’s Central League. In his rookie year with the Dragons, he not only was the Dragon’s first pick that season, but he also won the Rookie of the Year award that season. Kawakami is also no stranger to the international stage. 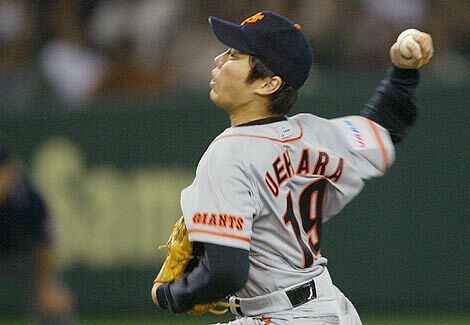 He was a pitcher on the Japanese Olympic team for 2004 as well as last year in the Beijing 2008 games. ABC & CCT via FG.